There are few former footballers we’d like to go for a pint with as much as Jack Charlton. A legendary defender for both Leeds United and England, Charlton became revered in the Republic of Ireland for his work as manager of the national team – both on and off the pitch. We’ve taken a look at some of the best quotes and stories about big Jack. Charlton, much like Bobby Robson, was famously never too good at remembering players’ names. According to Alan McLoughlin, during a game with the Netherlands, Charlton told Mick McCarthy to “stay tight on Van Cleef”. “Mick had to tell Jack that Lee van Cleef was a dead Hollywood film star!” McLoughlin writes in his autobiography. 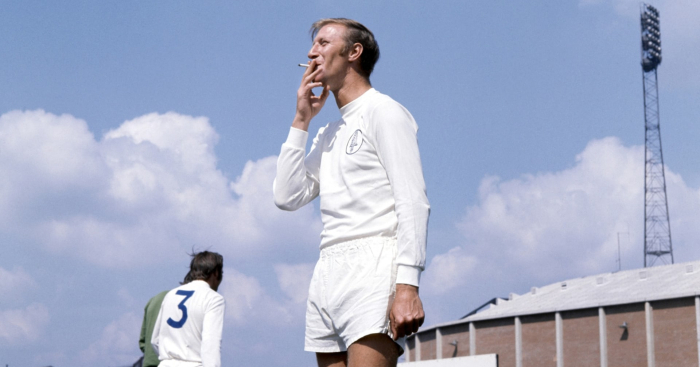 "There's something about Jack Charlton that makes me want to play for him. He could be the manager of Swaziland and I'd have jumped at the chance to play for him that night we (first) spoke… The man is infectious." On a similar theme, Chris Waddle recounted to the Daily Mail a tale of how Charlton named Newcastle’s starting XI for George Reilly’s debut. “And he started to click his fingers as he looked at George Reilly. “And he said, ‘…and up front…erm…erm…erm…what’s your name, son?’ Still clicking his fingers. We’re starting to suspect Maurizio Sarri may have been at that game. Jack Charlton on the cover of his new solo album NORTHERN! None of your fancy pianos on this album, just big Jack, a guitar and a bloke on the spoons in the background. Charlton substituted Houghton during a 1994 World Cup qualifier against Northern Ireland, much to the midfielder’s disgust.